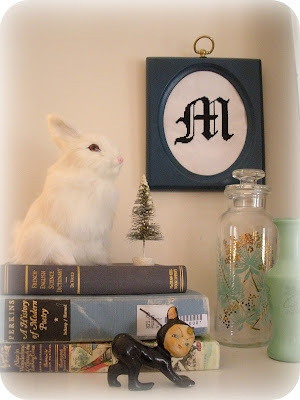 We've been busy getting our little home all cozied up and ready for the holidays. The gifts have been wrapped and the tree is trimmed. 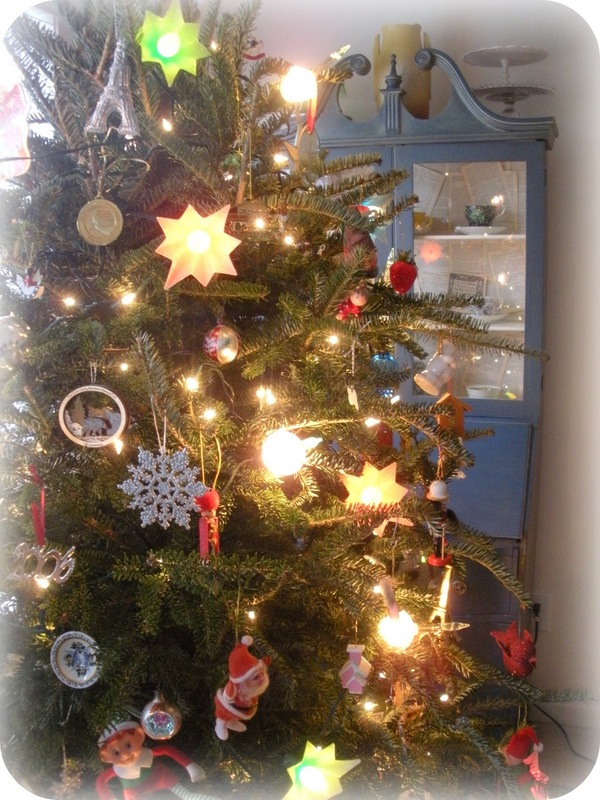 Here is a snippet of our very first Christmas tree. We are coming up on our fifth wedding anniversary but we were never settled enough to dig out our ornaments and goodies to decorate. We both have all of our ornaments from our youth. Decorating the tree felt like flipping through a scrap book of our lives. I love looking at the bubble lights and the twinkle stars. p.s. Please enter the giveaways here and here. Oh, and don't be surprised when I post another photo of our tree, I'm waiting to get our furniture back from being re-upholstered. We will be couch and chair-less for the next week. But who cares, we have a twinkle tree! while you don't have furniture the two of you should lay out picnic blanket out and enjoy your twinkle tree! You read our minds...that is the plan. We are going to get all of our quilts out and make pallets. I'm looking forward to peeking my head up under the tree, just for kicks. p.s. Happiest of weekend wishes to you dear friend. I love your cute decorations! 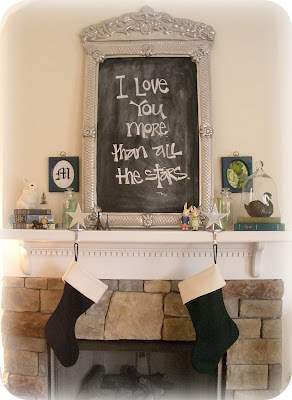 What a great chalkboard over the fireplace - love it! Enjoy the weekend with your gorgeous men! Your tree and mantle look just beautiful and magical. Nothing makes me happier than a Christmas tree lit up at night in a cozy home. The decorations are very pretty & festive! I love so much he vintage magazine!